The valley of the Rhone between Brig and Visp is a place of odd contrasts. On its parched floor, ancient hay barns vie for space with high tech business parks while above, vast mountain slopes drop from fields of permanent snow to sun-warmed vineyards – from Arctic to Mediterranean in 2 vertical miles. Our bus rumbled on through the dusty late summer heat, passing here a cornfield sandwiched between a furniture warehouse and a Scania Trucks depot. My destination was Saas Fee – which at 1800 metres is one of Europe’s highest villages – and the bus soon left the Rhone behind to begin a long climb at first following the deep wooded Mattertal Valley – which is the way to Zermatt – then the equally precipitous Saastal which like its neighbour rises southwards to the highest peaks of the Swiss Alps and the Italian frontier. In Grindelwald, which I’d left that morning, the really high mountains are situated on one side of the valley. 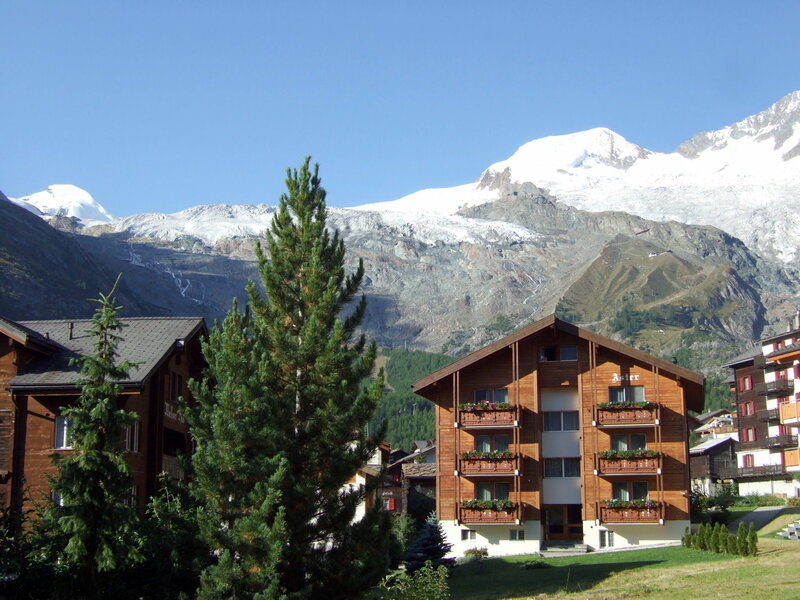 In Saas Fee – as in nearby Zermatt – they are all around. Vast horns of rock rose to the clouds both up and across the valley while to the West was a mountain wall of seemingly immeasurable height – this was the Mischabel Range which contains four peaks of over 4000 metres including the Dom – the highest Swiss summit not shared with Italy. Also like Zermatt, you can walk through the pleasant traffic free streets – more towns should adopt this rule – and just by walking up a side street be in the forest or on open meadow in five minutes. The buildings here are in a traditional chalet style often with well tended window boxes of flowers adding additional splashes of colour to the picture postcard houses. In a way they’re almost too neat and tidy and the original wooden houses of the old part of the village have far more character. 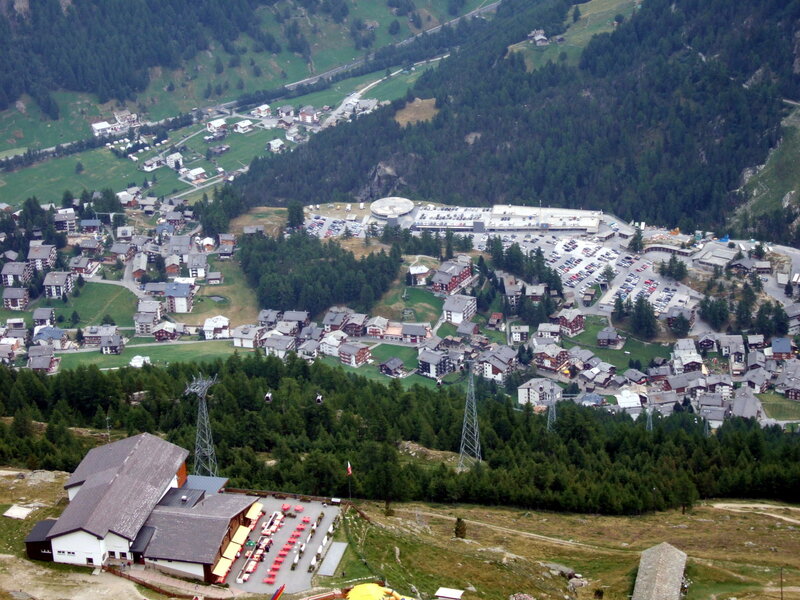 The profusion of hotels and restaurants in Saas Fee clearly indicates tourism rather than agriculture to be the main livelihood here but the place began as a farming village and grew when alpinism first became popular with people coming here for the challenge of the mountains. I was most pleased with my hotel – having asked tourist information opposite the bus station for the cheapest room available, I’d fully expected a shared bathroom several miles away from my bedroom but entering the annex of the Hotel Europa revealed that I had a comfortable en suite room and that my view of the Eiger of the last couple of days had been replaced by one of the Dom which if it appeared to rise straight from the end of the road it was because it did. A cable car – the Hannig Lift – ascended from the street behind the hotel to scale the lower part of the Mischabel Wall and as it was still early afternoon I decided to head up there. The cable car climbed quickly and silently above Saas Fee, soon reaching the timberline and heading on to the upper station of Hannig at 2340m where I sat outside the restaurant for a while with a bottle of water and contemplated the weather. 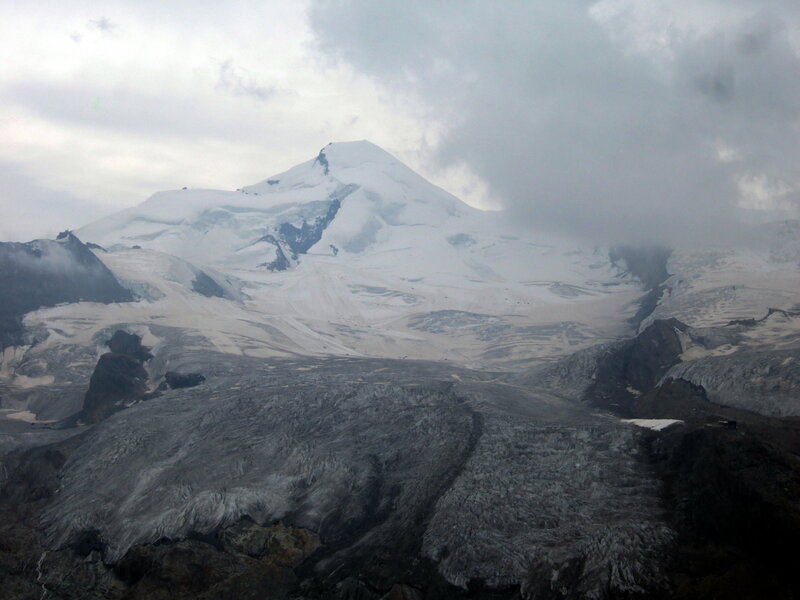 The grey ceiling which promised rain later had already cut off the 4000m summits of Weissmies and the Allalinhorn while the icy mass of the Fee Glacier at the valley’s head faded into dark mists, the Alphubel above it having already vanished. From my vantage point down to the toy town houses of Saas Fee though was still clear enough and it wasn’t too cold though the earlier heat of the Rhone Valley was well and truly left behind. I planned to walk down the first part of the high level footpath known as the Gemsweg which links Hannig with Plattjen on the valley’s opposite side though I was heading down to Saas Fee rather than doing the full circuit of the valley because of the time and the less than reliable weather conditions. First of all though, I headed up the mountain, turning right from Hannig. My map showed the path reaching a minor summit invisible from here so I thought that if I wasn’t doing the whole of the Gemsweg, I’d see what was up there first as it didn’t look so far. 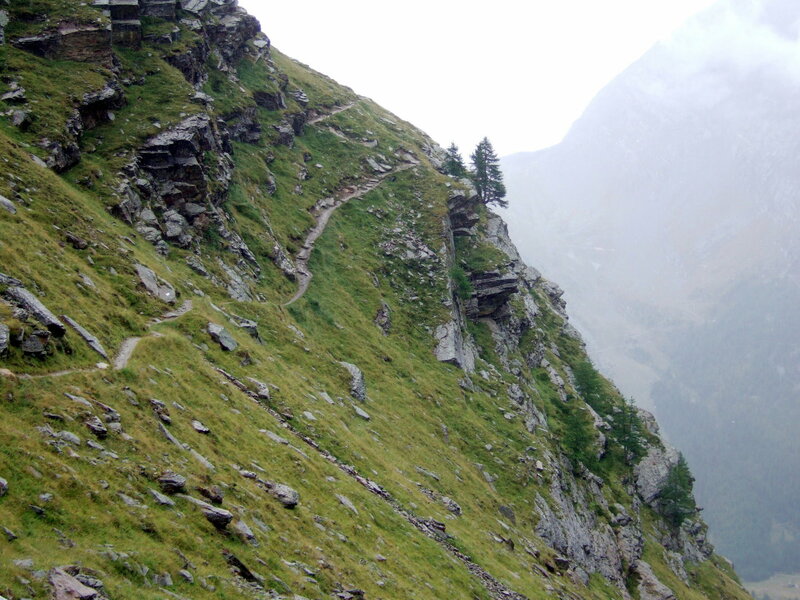 The path was clear and well signposted – as they generally are in Switzerland – and made its way in wide switchbacks up the steep – almost precipitous mountainside. 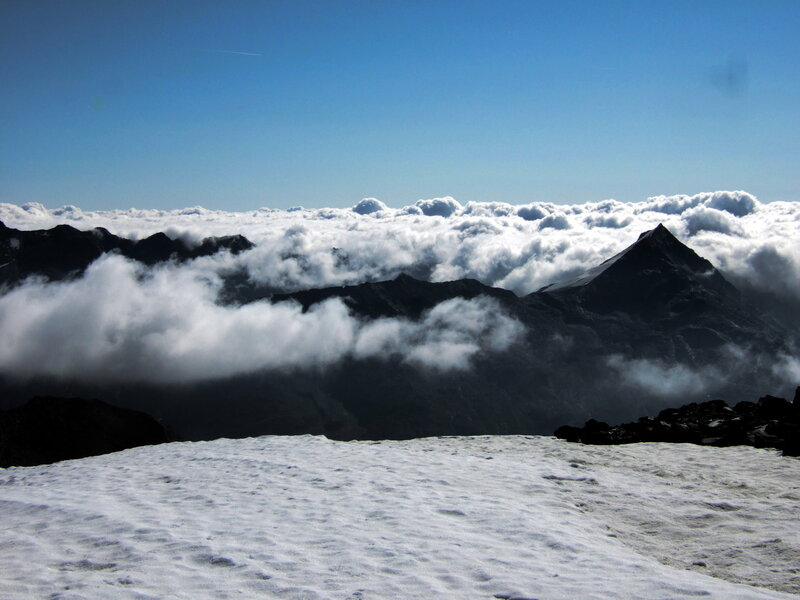 I soon arrived at a viewpoint with a seat dedicated to who I presumed was a local mountain guide – Xavier Burmann – and as I surveyed the Saas Valley and Hannig immediately below, I became aware of a noise to my right. A slender delicate looking creature with a tree brown coat and small goat-like horns made a tentative approach to climb onto a nearby rock and began to lick what must have been a vein of salt – it ignored the vegetation. This was a chamois or gemsbok – after which the trail below was named and is smaller and more nervous than the ibex I’d often seen in the Alps. 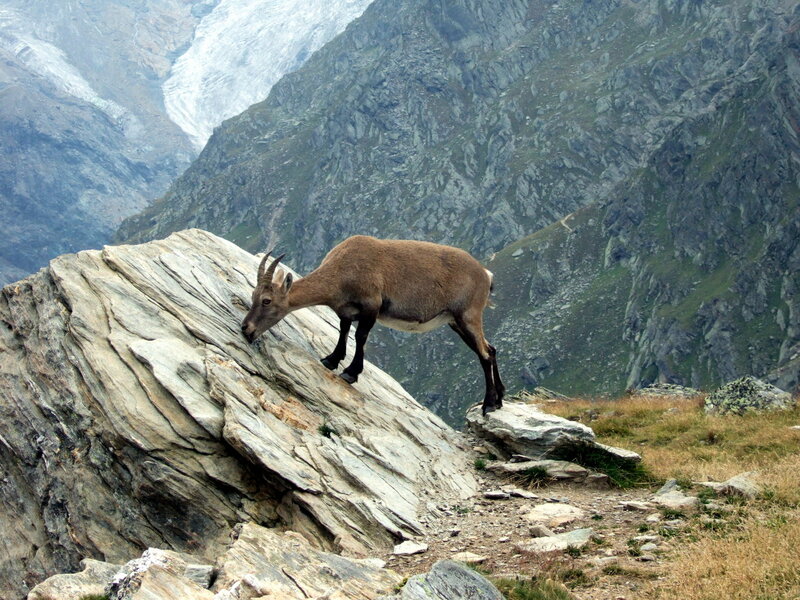 I watched the chamois for a while before resuming my ascent. It started when I moved but didn’t run off – soon returning to its rock. The path now began to wind its way steeply uphill, with occasional dizzying drops to one side but it remained wide and without difficulty. Below was a precipitous gorge-like valley with the precarious looking Gemsweg threading around the opposite slopes below me. 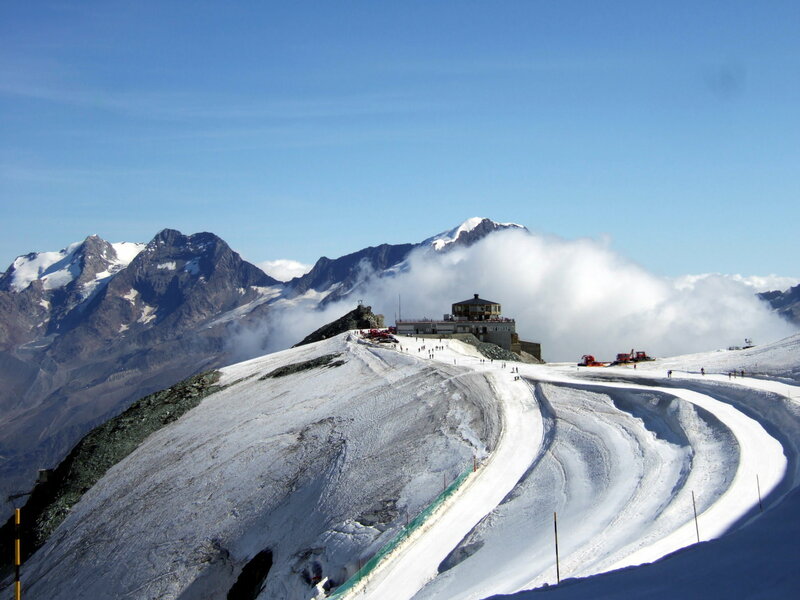 Much higher up – a vast height above the Saastal was perched the Mischabel Hut on its rocky shelf at 3329 metres. I made a point to go up if the weather was good enough. The hut is reached by a dizzy path which is – apparently – easier than it looks, not requiring a parachute for descent! The hut is the start point for the ascent of the Nadelhorn and Ulrichshorn. If you suffer from vertigo, don’t go. I soon arrived at a minor summit with a cairn crowning its rocky top, a lofty belvedere 4000 feet above the valley floor but I had just a little further to go. A slightly higher top was reached via a short exposed section with a sign that declared Mellig 2700 m while beyond this second summit the path led off downhill slightly and into a wonderfully wild and rugged high country. The route here continues south high above the Saastal but I was going no further today. The close grey ceiling parted to reveal the snowy Nadelhorn still high above but the weather was coming in and I felt the first cold spots of rain on my face as I began the descent. Back at Hannig I donned waterproofs and resisting the urge to cheat and hop onto the cable car, set off in light but steady rain to begin the Gemsweg. The Gemsweg led steadily downhill, cutting across the steep slopes with the valley far below on the left. 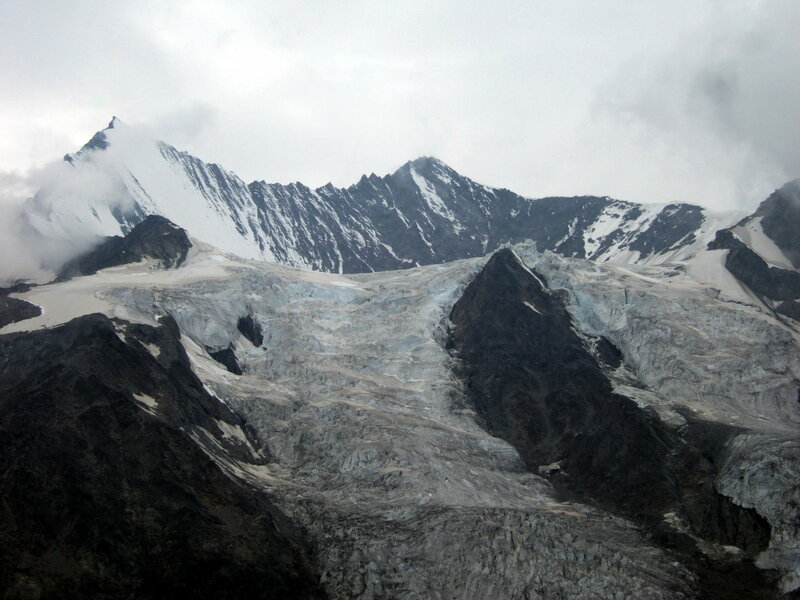 The mountains at the valley’s head had all but disappeared and the Saas Glacier appeared dull and grey under the darkening skies. After rounding a right hand curve, the path – still wider than it had looked from above – crossed a precipitous section of the slope before descending more steeply to where it crossed a river. An information board here declared that this area enjoys 300 days of sunshine annually and few wet days. I had had to wipe the raindrops off the plastic cover before I could read about the dry sunny climate of the upper Saastal and adjusting my hood to stay dry, I continued on down the path in the rain following signs for Saas Fee and Gemsweg. There is a more direct way to Saas Fee but the Gemsweg is signposted separately. I passed a steep looking turn off up to the right – the path to the Mischabel Hut – and a flock of sheep gathered on the path. To someone who frequents the Lakes and Snowdonia, sheep may not seem worth a mention – after all I’d just seen a chamois! They’re not a common sight in Switzerland though and as at home where they gather on the road despite having thousands of acres of grass to roam, these sheep seemed attracted to the path rather than to the surrounding pastures. After a section of gentle slopes, the path once again became a narrow strip of easy ground clinging to steep mountainsides and in this fashion it turned in switchbacks as it steepened down towards the valley. Soon I approached the first trees of the Saastal, their branches dripping wet with the rain. Here too the Gemsweg branched on around the top of the valley but as the rain was set in I continued down the zigzags to the valley floor where a wooden footbridge crossed the river and followed the path on the opposite side into the trees. At least I’d walked a small part of it and felt some satisfaction at not getting the cable car down because of the weather. The forest lasted maybe 10 minutes before I was once again on open gently sloping meadows. Ahead lay a great solid stone wall about 10 feet high. It appeared to be designed to keep out a powerful enemy and indeed it was for this was the town’s avalanche wall and no building is allowed this side of it. The wall extended right across the valley but a gateway appeared ahead through which the path led into the deep green – and dry – of much denser forest. 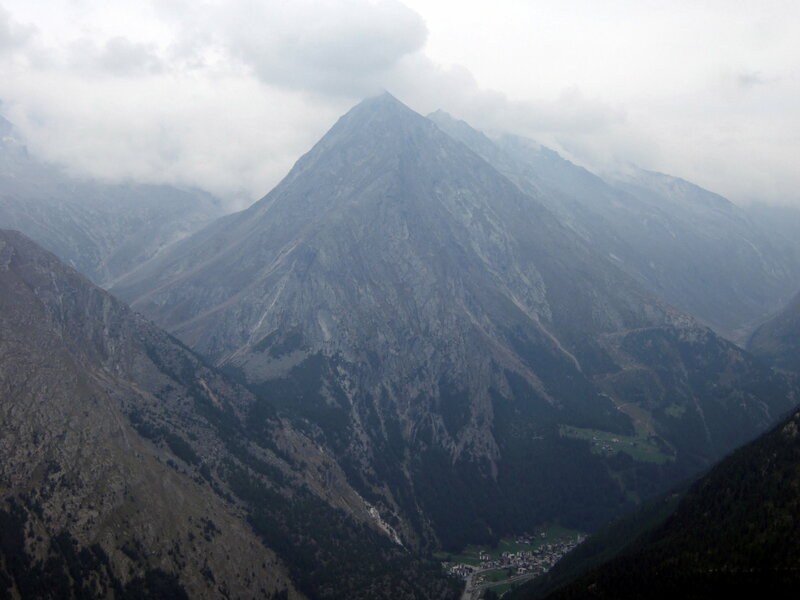 As I approached Saas Fee, I passed a number of ancient stone structures which turned out to be sheepfolds. It seemed that Saas Fee had a long history of sheep farming. Emerging once again from the trees, I found myself at the edge of town – back to my hotel then for a change of clothes and then off to find Spaghetti Bolognese and beer in that order. Despite the weather the day I arrived here Saas Fee remains one of my favourite Alpine destinations and is comparable to Zermatt across the mountains for the variety of hiking routes on offer in and above the valley. On days when the sun shone here are a few more pictures of the mountains of this area. 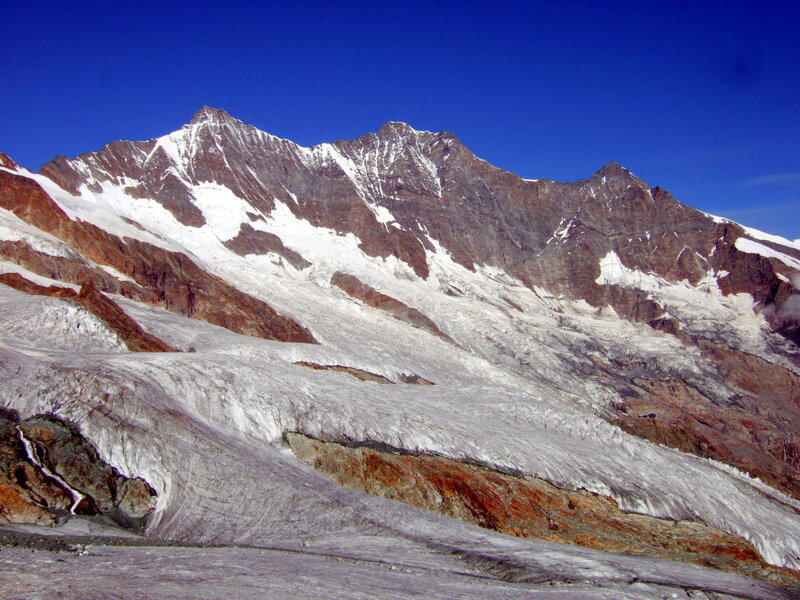 There are more hikes from Saas Fee and Zermatt on my Alpine Trails blog. This entry was posted in Hiking, nature, outdoors, Switzerland, travel, Uncategorized, writing and tagged Allalinhorn, Alps, Europe, hiking, holidays, landscapes, mountaineering, mountains, nature, outdoors, photography, Saas Fee, Switzerland, travel, vacation, walking, writing. Bookmark the permalink. Thanks – it’s a pretty spectacular area though! Saas Fee is cool for hiking – I didn’t do half the routes I wanted to but the weather is usually better than I had on that trip. Zermatt is fairly awesome as well.